Penguino Travel- The smarter way to travel with kids. Penguino Travel requested help building out the Itinerary feature of their new website. A responsive Itinerary feature for Penguino Travel's website. This was a 3-week sprint for Penguino Travel, a family-friendly travel planning website. Currently, the website's main form of revenue is through the sale of "travel boxes;" boxes that help entertain children during travel while educating them about the destination. The Itinerary will include guide recommended hotels, restaurants and family-friendly activities, provide personal 1-on-1 insight into the travel destination and mostly importantly, must be a responsive design. Before beginning on the Itinerary, I conducted an audit of Penguino Travel's existing content and recorded my findings in a Sketch document (image below). 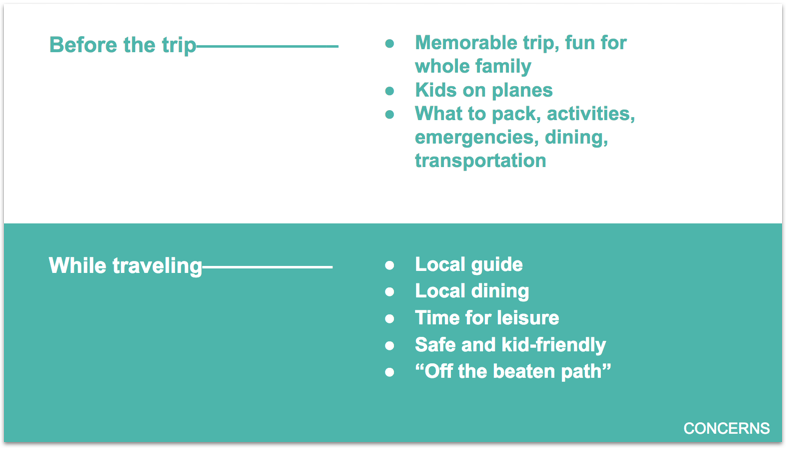 Once the audit was completed, I created a content style guide (also below) for Penguino Travel so that the company could ensure that content, voice and tone are consistent across all pages of their website; including their new Itinerary feature. Some of my suggestions per the Penguino Travel content were to keep the copy light and easily digestible. The wording should be appropriate and create an air of excitement around the upcoming adventure. Finally, I suggested that the language used be kid-friendly, meaning it should be understood by children if and when their parents read the site and Itinerary aloud. Additional tasks that I completed were writing and editing copy for the wireframes and final comps. I championed the creation and use of a quick and easy onboarding for the new feature and crafted a variety of content for the sign-up process and organization of information.